Tempo is an analysis tool I first encountered applied to Magic: The Gathering. It's a means to quantify the potency of a given card or play, a way to attach a number so that different cards/plays can be compared. In M:TG you have several resources available to you. Primarily you have your hand of cards and the mana you can generate in your turn. As well as that you have your deck of cards, and your life total and your graveyard. These different resources could be tied together using tempo. A unit of tempo is a measure of making progress in the game: you could gain tempo by either causing a gain on your part, or making your opponent lose something. In M:TG this worked out to being 1 Card = 4 Life = 4 Mana. So if you were playing, and had a chance to draw a card by paying three or less mana, then that would generally be a good deal. Attaching a value to a turn in M:TG is hard as you can do so many things in a turn. The simplest card in the game. This comes from the core rules: on your turn you may draw a card or play a card or purge. Thus a draw is worth as much as a play. The basic card everyone starts with a deck full of is the Charge card, which does nothing except give +1 Energy; i.e. the simplest play in the game gives +1 Energy. A Prime (the ability to gain an extra card during a purge) is also worth a turn: if you want to buy two cards costing 1ER with only the default single Prime you need to: play +1 Energy->purge->play +1 Energy->purge. If you have a +1 Prime then you only need to: play +1 Energy->play +1 Energy->purge. That is, it only takes 3 turns instead of 4 - you've saved 1 turn. Why is this useful? Tempo can be used in two ways: to analyse / work out the best play available to you while playing, and to help balance the game as the game designer. These are two different animals - I'll look at design in this post, and cover the play uses in a later post. In Progenitor all cards cost Energy to prime (to add to your deck). For the basic cards they have either 1, 2 or 3 Energy Requirement. 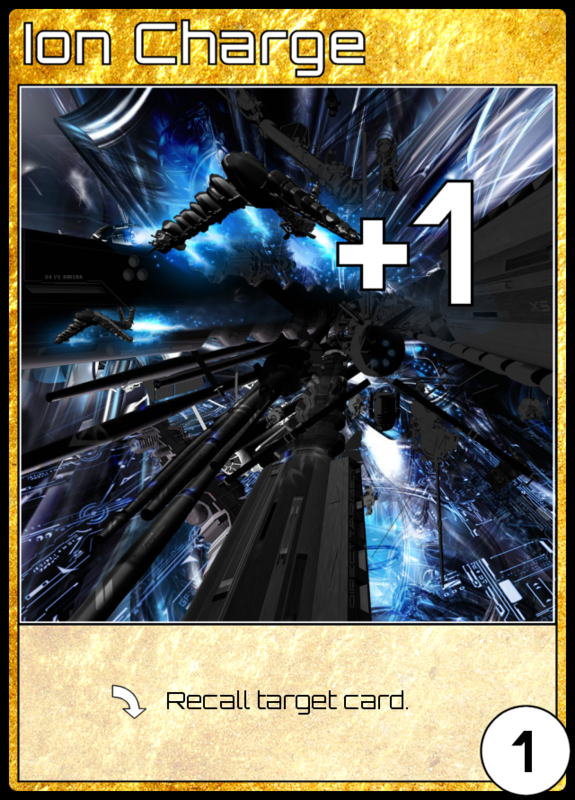 Basic game balance requires that all cards with a given Energy Requirement should be as powerful as each other - when the player is deciding what to add to their deck they should have to make a decision between equals. Put another way, when a player is priming cards from the board and they must choose between several cards which cost the same Energy Requirement, we want to make that decision as hard as possible. By finding out the tempo gain each card generates, we can directly compare their "power level" numerically. 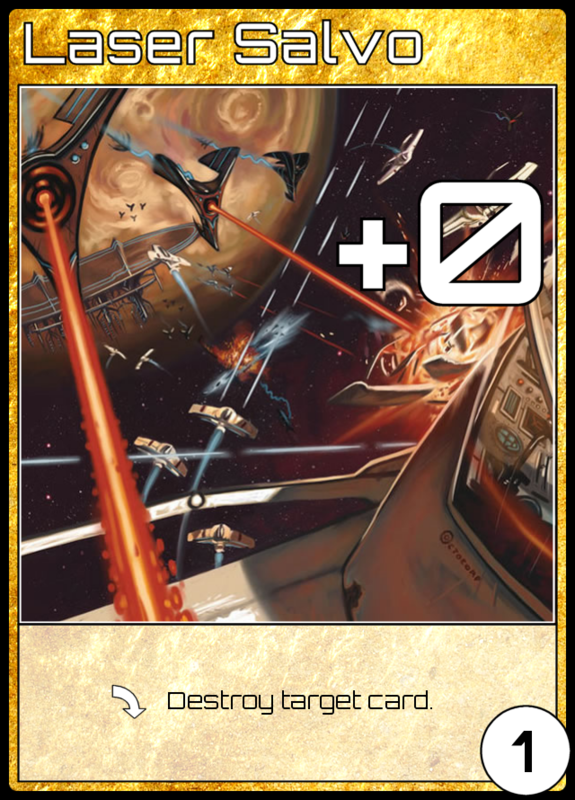 Let's look at the game's basic attack card: Laser Salvo. Least powerful, un-gimped attack card possible. Laser Salvo is the Platonic attack card; it does nothing except destroy any 1 card in play - it cannot be made simpler. What is its tempo? Well, when you play it you get to destroy an opponent's card. In the standard run of play, for an opponent to have a card in play they would first have to draw it (1 tempo), and then play it (1 tempo). Therefore by destroying an opponents card you make them lose 2 tempo. Their loss is your gain*, and so Laser Salvo is worth 2 tempo. 2 tempo is the default power level for all cards with 1 Energy Requirement. 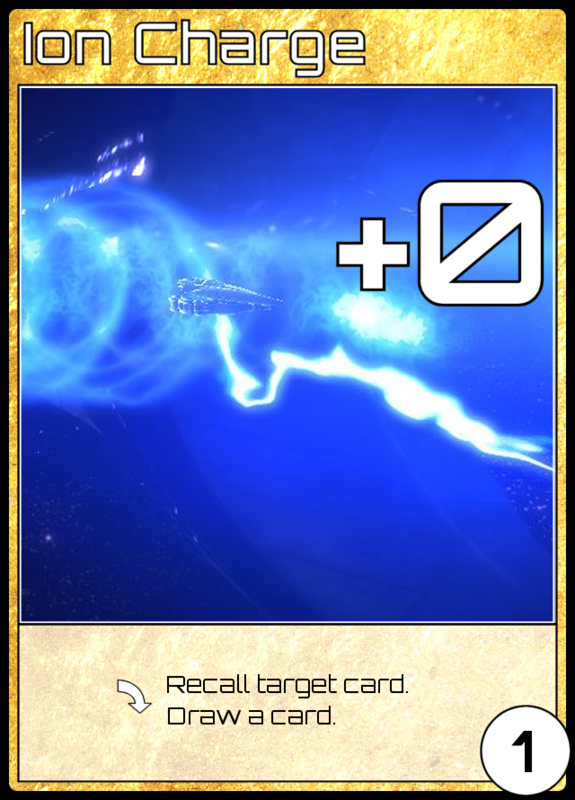 This comes not only from the Laser Salvo being the basic attack card, but from all the cards which are basically just Charge cards with one extra thing. For example, Power Surge (+1 Energy, Draw a card) and Supply Shuttle (+1 Energy, +1 Prime). Charge cards give 1 tempo when played (+1 Energy), so the minimum upgrade to them is giving them 1 extra tempo when played, thus all the 1ER cards tend to produce 2 tempo. Note that while comparing tempo values between cards can give you an indication if a card is under- or over-powered, it is still down to the designer to find a good solution to balance the card out. Take, for example, Ion Charge. Ion Charge is the simple 'bounce' card: when you play it you get to recall any other card. That is, return a card in play to its owner's hand. If this begins it's inception as +0 Energy, and we compare it to Laser Salvo, it's pretty clearly lacking: both produce no Energy, and both cost the same (1ER), but if you play Laser Salvo you destroy an opponents card, putting it in their discard pile, while Ion Charge would merely put it back into their hand: they'll be able to play it again immediately! This becomes concrete if you look at the tempo: while Laser Salvo costs an opponent both a draw and a play, Ion Charge costs them only a play (in effect you give them a draw when you put the card back in their hand), so is only worth 1 tempo. Therefor we need to add something to Ion Charge to bump its tempo up to 2 in order to make it as powerful as Laser Salvo. 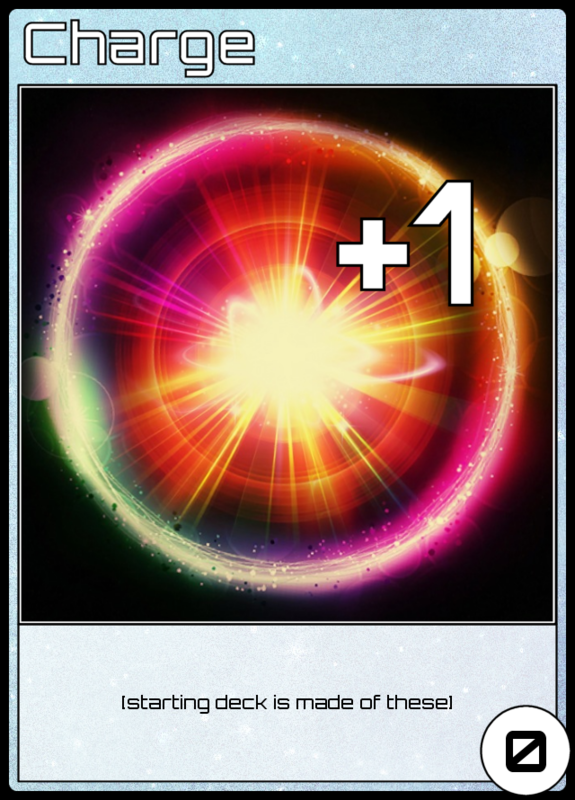 The simplest way to add a tempo to a card is to give it an extra +1 Energy, which was what I did with the original version of Ion Charge. However, play-testing showed this to be a poor choice. Imagine this scenario: you have 3 Ion Charge in hand. Your opponent plays Charge, you play Ion Charge and bounce it back to his hand. Repeat two more times: you now have 3 Energy, while your opponent has nothing. The opponent is not having fun - they feel like they're locked out of the game. If you are both racing for a face-up Progenitor card (a unique, powerful card) then this is extremely advantageous. In order to combat this I changed the +1 Energy into a card draw (the second easiest way to give a card +1 tempo). Now you can still repeatedly bounce your opponents Charge card, but you will not be improving your play position: you will still have zero energy (like your opponent), no closer to the Progenitor card than they are. You will, though, have drawn three new cards. * Their tempo loss = your tempo gain is only explicitly true in a heads-up, 1v1 game. In multiplayer games it gets more complicated: I'll look at this in a later post.